Purchased in 2002, this phone has done me good!! In an era where every cell phone at least takes pictures, my little phone chugs along and does his/her job. I've come to the conclusion that I will stick with my phone til' death do us part. And unfortunately that day might be coming sooner than later. My phone is starting to act its age. The battery life is dwindling, the phone just turns off for no reason at random times, and just last week the vibrate(one of the many advanced features) started and wouldn't shut off. Strange. I guess the numerous times I've dropped the phone over the years finally has taken its toll. Let's look at the I PHONE listed at $399(down from $599 a few months ago) and my phone(you can't even buy this model anymore). 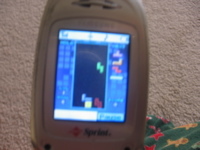 Yup...that's TETRIS! Look at those graphics. Albeit, you can only play for 4 minutes at a time and then start over cause it's a demo. I'd have to pay to download the real game, but that's not going to happen. 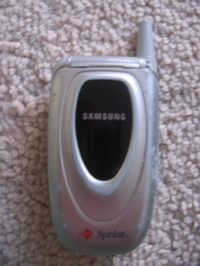 So my question to you people out there is....Does anyone or did anyone have this phone? And if the answer is DID, would you be willing to send me your battery? That way my phone can go on living forever. Wouldn't that be nice? 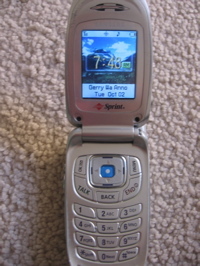 Am I embarrassed to have such a ghetto phone? No way. I'm embarrassed for those that have the IPHONE'S. I win, you lose. I'm the best.